As you walk along Bleecker Street, you are at no loss for restaurants. Any cuisine you can imagine, any price point, fancy, casual, fast food, good food, not such good food. 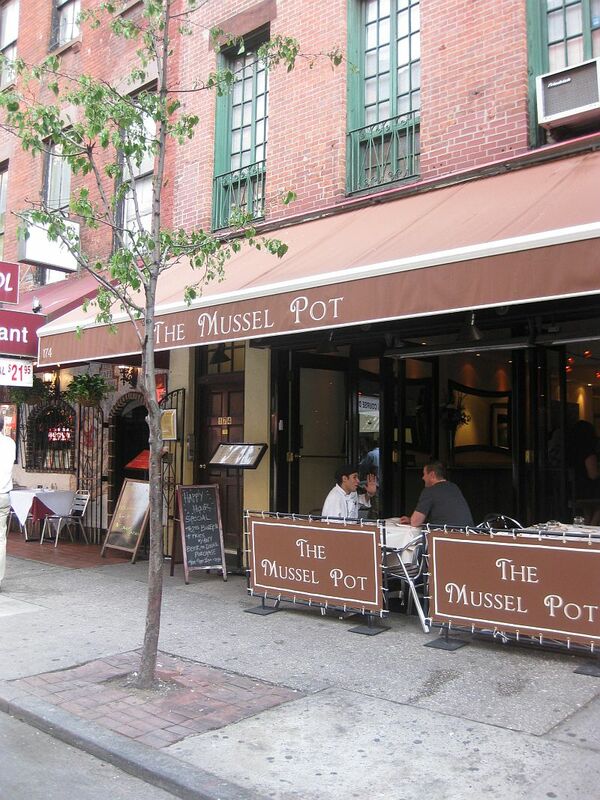 Along this stretch of restaurants Fork, and new found friend, Whisk, came across The Mussel Pot. And the Mussel Pot may be a combination of most of the above descriptions! We arrived at 6:30 and the restaurant was empty. The garden tables were all full, but the interior tables were completely empty. The restaurant itself is lovely and warm, beautiful mirrors run down one wall and the room is lit by dainty glass chandeliers. The garden has 6 tables around a small waterfall and coy pond. Sadly, they were all taken, but we were able to sit at the table right next to the door. Our waitress, Jacky, came over and introduced herself to us. Pleasant, warm, and attentive. We asked for the wine list and found a nice bottle of Pinot Grigio. Truthfully, the wine is a bit on the pricey side and this bottle was not chilled enough. THe bus boys were quick with ice, filling water glasses, and whisking plates away. Never once did they approach the table to remove a plate until it appeared both of us were done. HUGE points for that one! We ordered two appetizers. They took a ridiculously long time to come out of the kitchen. The surprise in this? One of the appetizers was raw. With or without the long wait, this appetizer was outstanding. Tuna Tartare. Seriously fresh tuna, sitting on a 1/2″ thick disk of guacamole. The guacamole was fresh and chunky and a perfect partner to the tuna. On top of the tuna were some microgreens and a splodge of a citrus miso mayo type condiment. To give the plate a little texture there were some house-made potato chips served alongside. 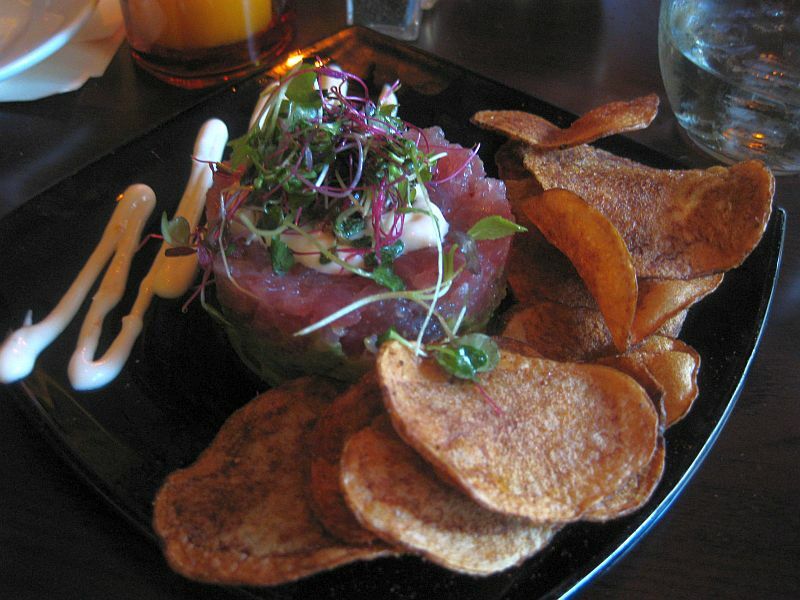 The chips were a really nice addition to the tartare. You could scoop some up on the chip and have all the wonderful flavors at once. Our second appetizer was Fried Calamari. Fork is a total sucker for fried calamari. Sadly, this was not so great. The presentation was lovely. We loved the idea of three sauces. And there ends the love fest. 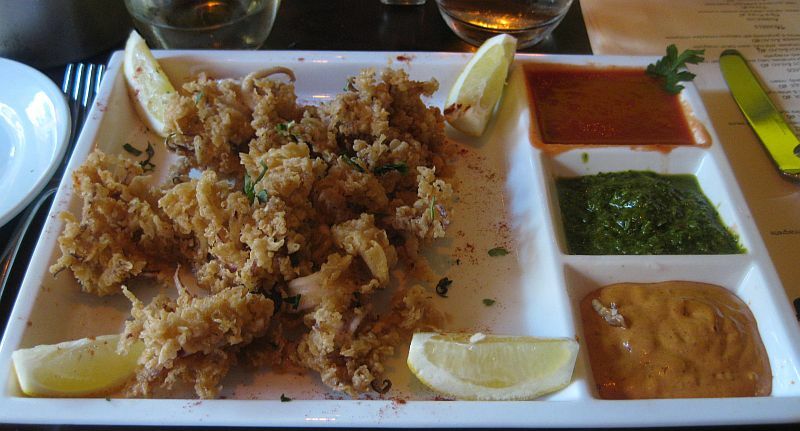 Fried calamari consists of 2 parts – the legs and the rings. There were perhaps 3 rings and all the rest legs. Whisk doesn’t mind the legs. Fork really doesn’t like them at all. Really, not at all. And the rings that were there were very chewy – like rubberband chewy – which usually means they were frozen. The coating, while really crispy, was not seasoned anywhere near enough. Then there were the three sauces. There was a spicy remoulade – spicy here is the key word. I was too spicy to enjoy. The Fork and Whisk like spice in their food but not to the point of inedible. There was also a tomato sauce water. It was flavorless and so thin in consistency that nothing stuck to the calamari when you dipped it in the sauce. The third was a chimichurri. All we can say about that is – meh! Really disappointing appetizer. So, the schtick with the with the Mussel Pot is – well, really, it doesn’t need explaining – MUSSELS. 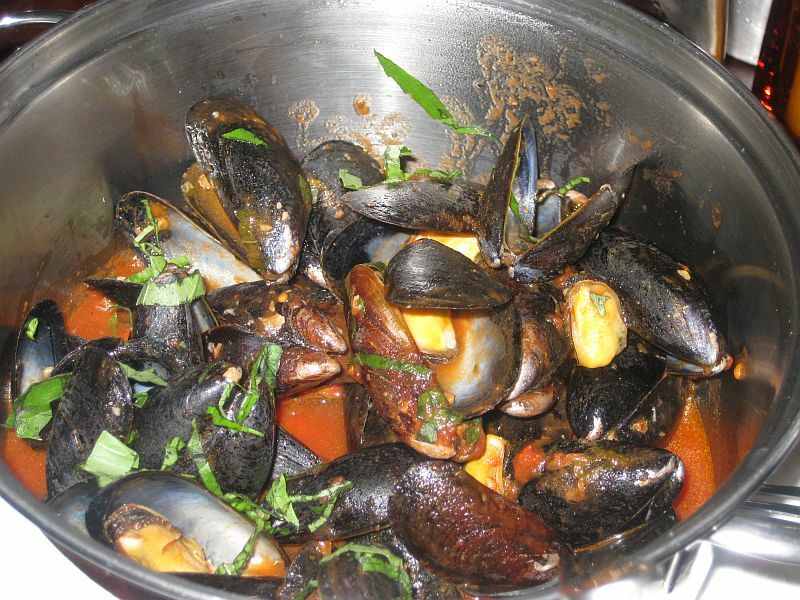 There are 5 different cuisine styles and 15 different ways to have mussels. They range from intriguing to what were they thinking. What is glaringly absent from their line-up is Moules Mariniere. The mussels are all served in individual stainless steel mussel pots. Okay, we get it. mussels, mussel pots. Cute. Problem? They are pretty tall and you are eating peering over the top of your pot, holding your fork or spoon at an odd angle. Really not a comfortable way to eat. Whisk ordered the Paella style which included clams, chorizo, fennel, tomatoes, peas, white wine, saffron, bay leaf and lemon juice. The clams were unnecessary. The broth was delicious. There was a background warmth to it that turned out to be cloves. Really nice combination of flavors. Fork ordered the Posillipo style. A light tomato sauce, garlic, white wine and basil. Very good mingling of Italian flavors. There are plenty of mussels in each pot. 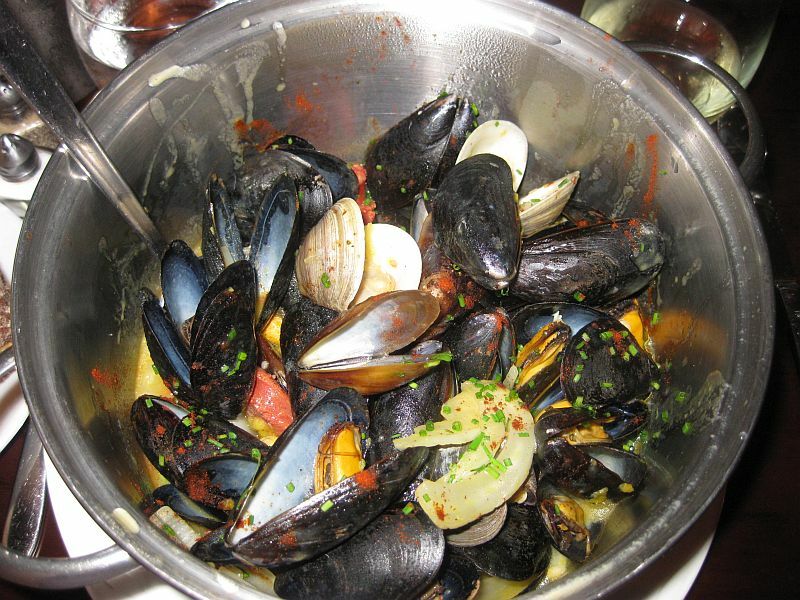 They serve bread with the mussels so you can sop up all the sauce – which is also difficult with the gigantic pots! They bring a small slice of bread each, which seems kind of silly. But they gladly bring more if you ask. Nothing really struck us for dessert. 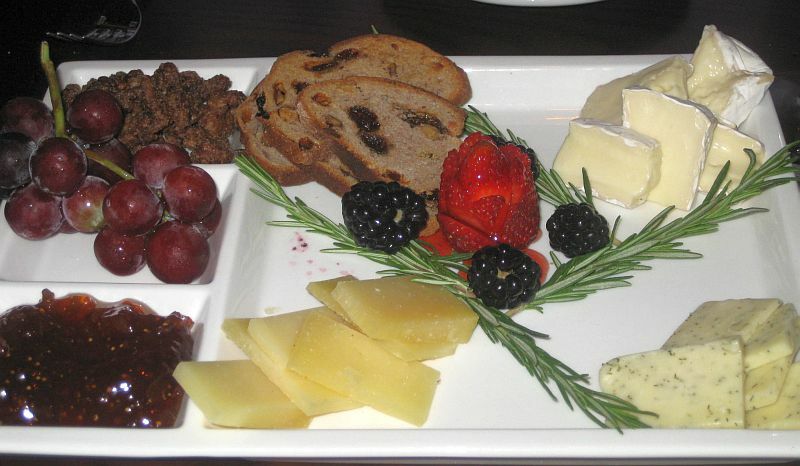 But we were instantly drawn to the Cheese Plate by the words “a variety of the finest imported cheese accompanied with honey comb, fig chutney and candy hazelnuts.” (They desperately need someone to proofread their menu). Okay. There was Brie. There was, to quote our waitress, some kind of parmigianio. There was Havarti with dill – the least dessert type cheese you could ever find. There was fig chutney. There were candied pecans which were very soft, which means they have been sitting around a while. There were grapes. Now, if you are missing TWO essential ingredients on a composed plate and are subbing – don’t you think you should tell the patrons and ask if they would still like to have that dessert? We couldn’t recover from the honeycomb, candied hazelnuts and havarti. Nothing was terrible, but nothing was outstanding beyond the tuna tartare. The staff needs to be better informed of what is in each dish, what is not going to be available and most of all – how to pronounce things on the menu. Oh, one last thing. If Fork or Whisk had gone downstairs to the restrooms before we ate, we would have left. There is. The worst. Fish. Smell. And (as if you need another thing) they have unisex restrooms. Gross. And the floors are all wet from God only knows what. Try it. Perhaps your experience will be different. I, for one, am very glad I had a 30% coupon from Blackboard Eats or I would have been far more disappointed. I had a similar experience and wrote a similar review. Glad to know it’s not just me! I was going to give it another chance, but maybe because we had that lovely seat right in the middle of the pond.